Typically, in a store, soap is displayed on a shelf or in a bin. 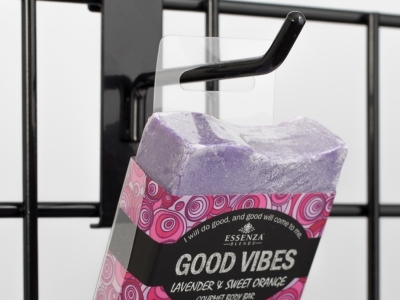 Olympic Mountain Products selected Do-It Corporation’s R-KJC Hang Tab to hang its Good Vibes soap bar in the consumer’s eye zone. The R-KJC hangs the bar of soap on a peg hook or display strip while still allowing it be placed a on shelf, if necessary. In addition, the R-KJC hang tab is scored along both sides to allow it to wrap around three sides of the bar of soap. This approach ensures that the bar will hang straight and secure anywhere in the store.